https://sheisfiercehq.com/shop/ buy now As a woman and a mother who is deeply concerned about climate change, a decision by the California Public Utilities Commission (CPUC) a few weeks ago enabled me to take a break from my feelings of dread. In fact, I all out rejoiced. http://2blades.org/ generic viagra without a doctor prescription On June 21, 2018, the five-member CPUC swiftly and unanimously decided to reject San Diego Gas & Electric (SDG&E) and Southern California Gas’ (SoCalGas) bid to install a 47-mile-long, 36-inch diameter gas pipeline in San Diego County. The pipeline had been contested by Santee residents, and environmental groups, such as Save Mission Trails and Sierra Club, since one potential route would have taken it through Mission Trails Regional Park. https://conversionfanatics.com/healthandwellness cheap generic viagra mail order pharmacy The line would have been named Pipeline 3602.
read more After the vote, I felt confident that California state agencies are truly committed to environmental protection. Senate Bill 350, the Clean Energy and Pollution Reduction Act, requires a 50 percent renewable portfolio standard (RPS) by the year 2030. That is, this standard requires that half of the utilities’ energy sales must be from renewable resources, such as solar or wind energy. Senate Bill 32, the California Global Warming Solutions Act, requires a 40 percent reduction in greenhouse gas emissions below 1990 levels by the year 2030. To meet these goals, a whole suite of measures must happen. Presently, we are seeing massive electric vehicle charging investments. The California Energy Commission recently passed regulations requiring solar panels on nearly all new houses, with additional incentives for electric space and water heating. Locally, six cities that make up 50 percent of San Diego County’s population have committed to obtaining 100 percent of their electricity from clean energy sources by 2035. “All of these things add up to reduce gas demand, thus making the need for the pipeline obsolete,” Vespa continued. With the CPUC vote, California announced that investing in new fossil fuel infrastructure makes no sense. 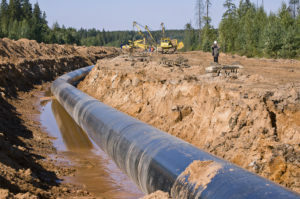 From the time the utilities’ proposal to build a new pipeline first crossed his desk, Vespa started to argue that the line would become a stranded asset. With the CPUC vote on Pipeline 3602, California asserted that economic prosperity and environmental sustainability are not mutually exclusive. “We can get to these climate goals and a basically carbon-free energy system at the same cost as a business-as-usual scenario, provided we don’t invest in fossil fuel infrastructure, provided we pivot to clean energy at every opportunity,” Vespa said. California is well on its way to reaching the 50 percent RPS goal. In 2017, the California Energy Commission reported that about 30 percent of retail electricity sales in California were from renewable sources, mostly wind and electric, but also geothermal, biomass, and small hydroelectric. By rejecting the pipeline, California showed it takes the climate change crisis seriously. And crisis it is. According to the majority of climate scientists, the earth’s average surface temperature has increased by more than 1.4 degrees Fahrenheit over the past 100 years. This temperature rise coincides with the time period in which humans engaged in large-scale endeavors to extract and burn buried hydrocarbon resources (fossil fuels), including coal, oil and natural gas. NASA reported that 2016 was the warmest year on record globally. The U.S. Forest Service reported that, in that year alone, 62 million California trees died. Since 2010, 102 million died in the state’s drought-stricken forests. Across the world, heat waves are longer, glaciers and ice caps are melting, and animal species are facing extinction. Bill McKibben, who founded the environmental group 350.org, warns if we don’t act fast, eventually we will have a climate that can no longer sustain civilization as we know it. On June 21, 2018, the day the CPUC rejected the utilities’ proposed natural gas pipeline, California showed it’s not going to be stuck in the past; it’s moving forward with resolve and innovation. California, as a trailblazer and the sixth largest economy in the world, is going to continue to prove that environmental sustainability and economic prosperity can go hand in hand. My hope is that the rest of the nation will follow suit, quickly. To learn more about the climate change, I recommend The National Research Council video series entitled “Climate Change: Lines of Evidence.” This series can be viewed at the bottom of the homepage on climatechange.ca.gov. — Colleen Cochran is a legal editor and a San Diego-based coordinator for Food & Water Watch, an energy and environment advocacy group based in D.C.